We drive down narrow roads, rarely passing anyone, heading for the shore. Our only company is the landscape and the sheep and cattle grazing. We arrive at the end of the road a few steps from the rocky beach. The tide is out so far that you can’t see the water. 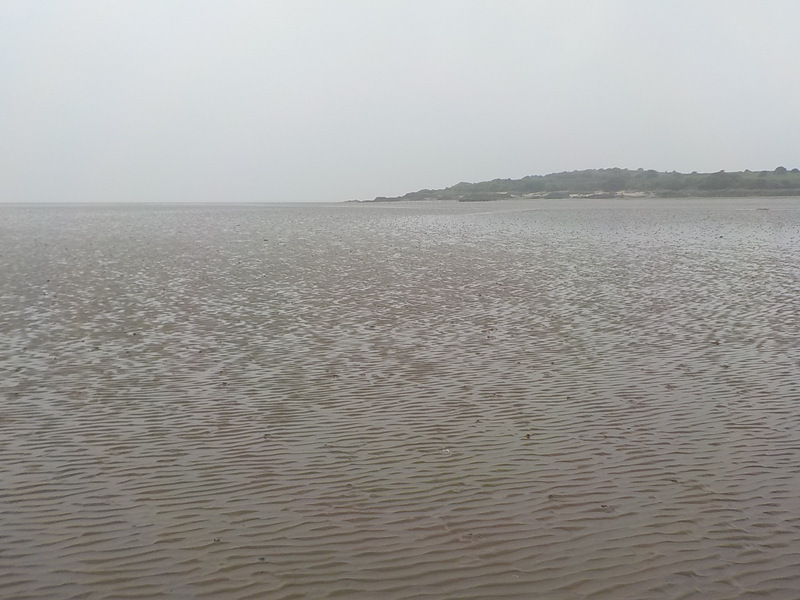 This is a huge mud flat. What do we find upon turning the corner? 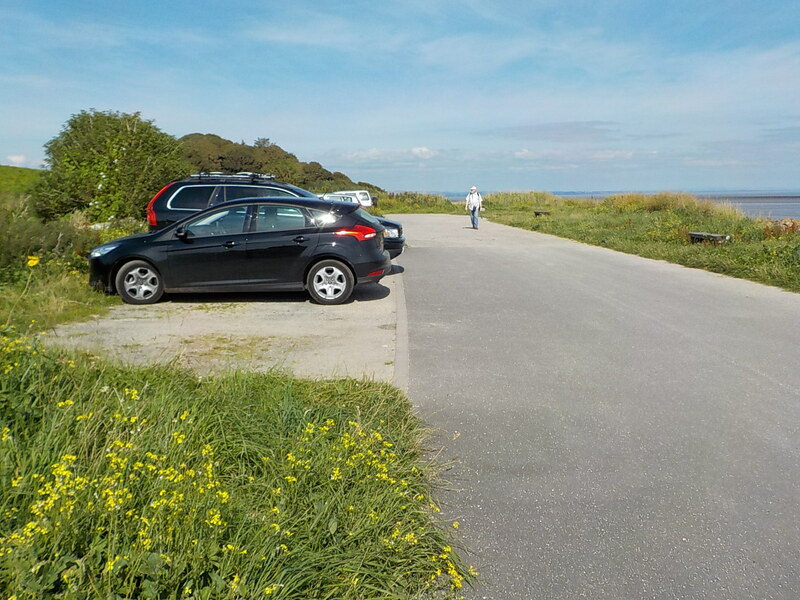 A car park for 15 cars, half full, with people camped on the beach for the day. The immense tide flats were harvested of their cockles (small clams) for years. Today, cockling is prohibited along the Solway coast, with the promise that eventually it will be allowed under a strict system of permits to protect the clams from over-harvesting again. Even without cockling, when the tide comes in there is swimming, sailing, and windsurfing, hiking along the shore and beachcombing. Where does everyone come from? Why are they in this place that seems remote until you get here? I believe that the answer is in changing times. Southern Scotland was a political hotbed up until de facto union with England in 1603. That means that the peak construction and use of castles was centuries ago. Since 1603 there have been huge changes to the world. In its early days, the industrial revolution aided this region, the Solway coast, as ports were needed to move goods by ship. The coming of the railroads turned many of these small ports into ghost towns. 150 years ago the coastal town of Carsethorn was the shipping harbor for Dumfries. Railroads took over much of the commercial movement of goods. Today Carsethorn is a stop along a coastal walking trail, known for its pub. 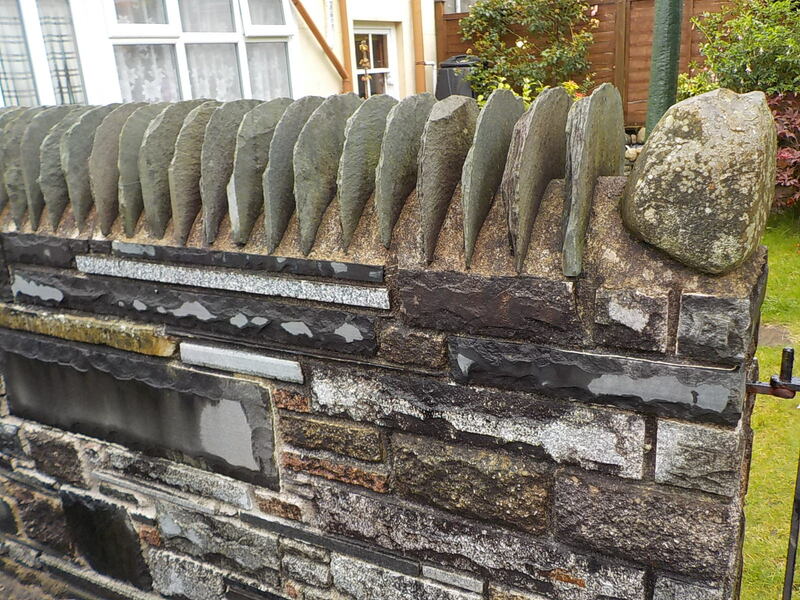 For much of the same period and beyond, granite and slate quarries produced building material that was used locally, also shipped to London and beyond. Slate is still used for roofing in this region, while in the US it is costly, a premium material. Granite quarried here is not the figured granite used in contemporary counter tops, but granite used to build stock exchanges, railroad stations, and paving stones. 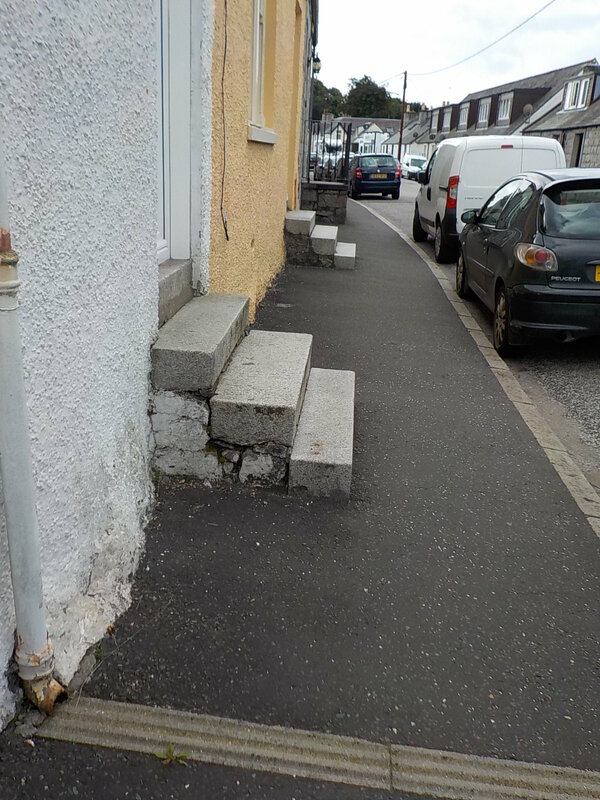 Most homes in Dalbeattie have granite steps (below, left). There is some very fine work in granite. 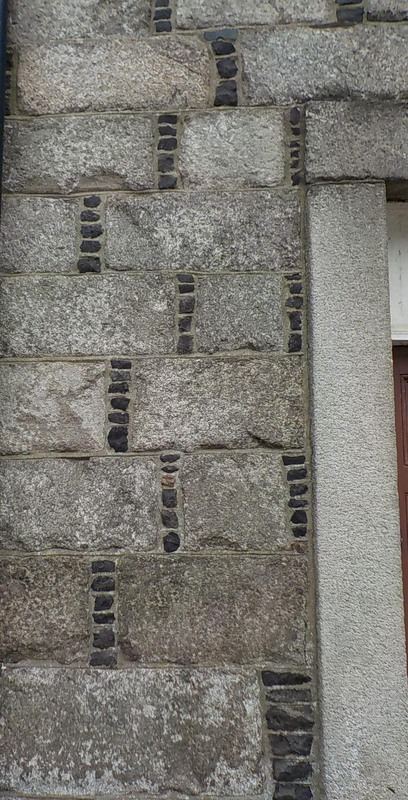 I like this combination of granite and small stones on the facade of a house in Gatehouse of Fleet (right). Slate is also used creatively (below), as well as in roof tiles. Most of the quarries are no longer in use, and many, including two adjacent to the town of Dalbeattie, are now forested parks with walking trails used by walkers, runners, mountain bikers and other cyclists. One of the solutions to the economic bust that followed the boom of the Industrial Revolution is the substitution of tourism for business travel. Though we don’t meet very many American tourists, we do see the occasional American, French or German visitors. We do come across lots and lots of visitors from elsewhere in Scotland and the UK. People have second homes in the Dumfries and Galloway region, they come in RVs/camper vans, they hike and camp or stay in B&Bs. And now they use Airbnb like we do. This explains why we see visitors at every archaeological or historic site we stop at, every castle, every beach. There are cafes in many places that have no other services locally. The festivals that seem to be taking place every weekend all summer in every small town in southern Scotland are a combination of annual reunion for those who have moved away and activity for those who are visiting. 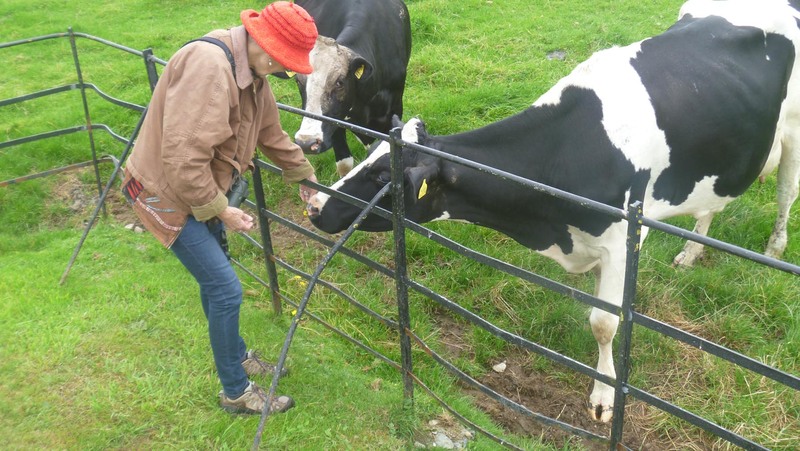 Economic continuity comes from farming, cattle, sheep and pigs. Endless green fields bordered by stone walls carpet the area and hundreds of animals graze across them as you drive by. These cows were grazing on the farm around an archaeological site we visited and seemed happy to check us out. Scots in this region have long been farmers and that is still an important part of the economy.